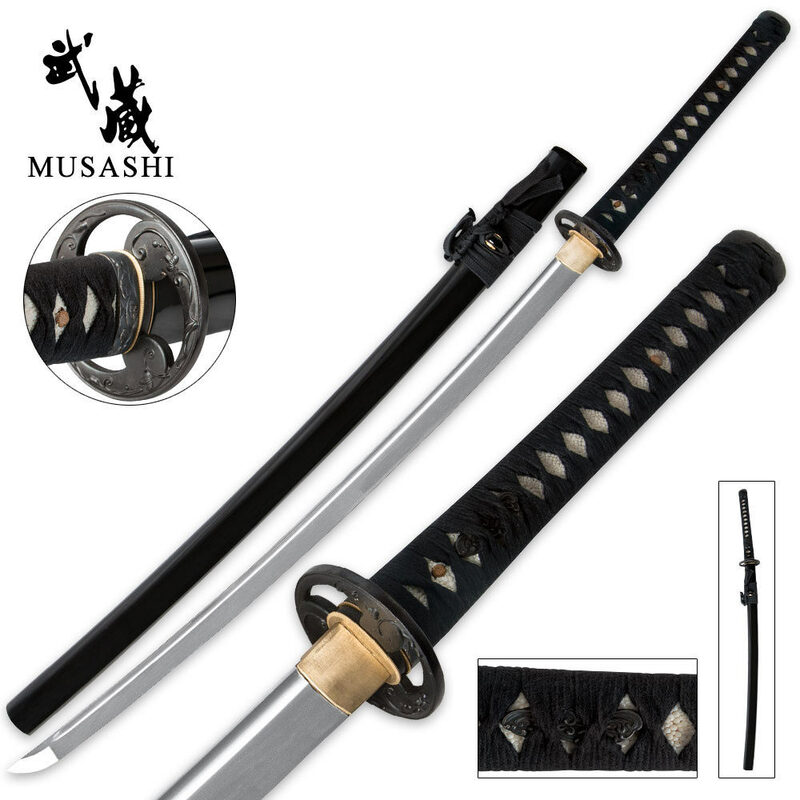 Whirlwind Musashi Carbon Steel Katana Sword | BUDK.com - Knives & Swords At The Lowest Prices! The Whirlwind Musashi Sword is sure to knock the wind right out of your chest! This sword features a handmade, full-tang, 1060 high carbon steel blade that has been clay tempered and honed to a razor sharp edge. The handle is constructed of hardwood and offers ray skin with tight cotton cord wrappings. The steel tsuba features a highly detailed design that alludes to the wind. 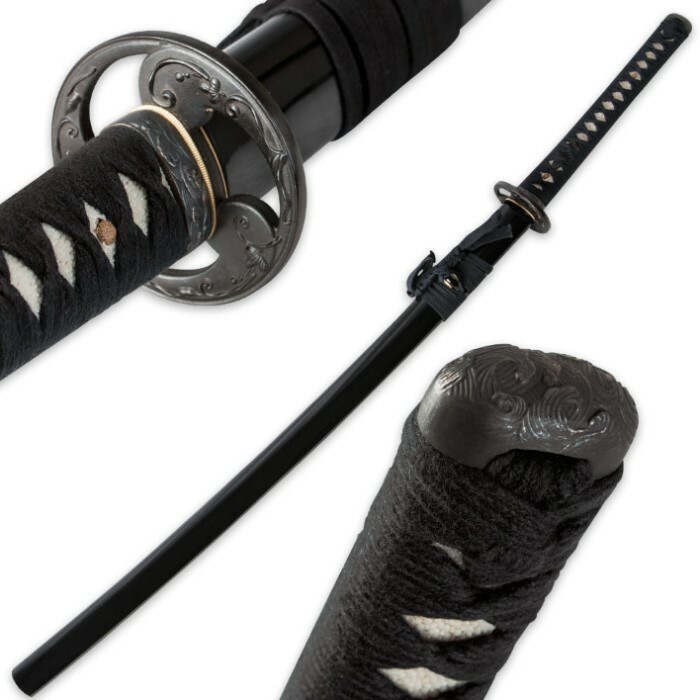 The tsuba complements the hardwood scabbard with high quality piano paint finish and steel fittings. Includes black cotton sword bag. Add this sword to your collection today - you won't find many like it! Well I've had this katana for about a month now, and I must say I am very happy with my purchase. The sword came sharp enough to cut but not quite as sharp as I would have preferred. Good solid tsuka (handle) with everything tight and secure. Very slight rattle while in the saya but not at all bad have to shake it fairly vigorously to get the rattle. You really cannot ask for a better sword at this price. Hamon looks really good and adds a touch of authenticity. I even got my name engraved on the blade not a true engraving more like an etching (which is actually better) and looks nice. Once again I am very pleased with this purchase. Just received my sword, haven't cut with it yet, probably won't for a while. First off let me say this is a beautiful sword for the cost. It has its flaws, but it's not a multi thousand dollar sword. My sword has a couple of small discoloration on the blade, doesn't effect anything so it doesn't bother me. The mekugi are not flush and are in at a bit of an angle, but they are secure, so again, I don't really care. The handle wrap is cotton; functional and price effective to keep the sword price down, so I'm happy with it. The blade is beautiful, the hamon is real, the saya is solid and well finished, it's balanced we'll, razor sharp, and feels great in the hand. You want a display piece? But a display piece. You want a sword to use, even if it's only in the back yard, this is a great deal. And if you damage it, so what...it was inexpensive, but another. Just after WWII, the Japanese government ordered all family heirloom katanas to be turned over (public disarmament), and a friend of mine bought one and brought it home in 1945 from the Sasabi Naval Base in Honshu, Japan. It has since passed to me, and comparing the two, this Musashi katana is much better made. It fits in the saya very well, the habaki and tsuba are very tight and not loose. The sword feels balanced and not overly heavy, and you can tell by the scouring on the blade that it's been handled correctly at the forge. For a cheaper-priced katana, I'm very impressed. Also... the blade's edge isn't rounded like most, including my old one from Japan. It's very sharp, handle with care. I like this sword; definitely a well made fully functional weapon. You could tell by holding it. It's a tight and sturdy tool; great value for the money; more than I expected. BTW True Swords is an excellent company. This was in my third order with them.